Mr Key, who on Monday called an election for 20 September, said the vote would be held within three years. The current flag shows the Southern Cross constellation and includes the Union Jack - the UK's national flag - in one corner. 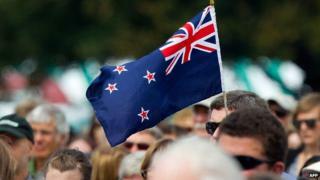 Mr Key said the flag represented a period of history from which New Zealand had moved on. "It's my belief... that the design of the New Zealand flag symbolises a colonial and post-colonial era whose time has passed," he said in a speech at Victoria University. "I am proposing that we take one more step in the evolution of modern New Zealand by acknowledging our independence through a new flag." Mr Key said that he liked the silver fern - popularised by national teams including the All Blacks - as an option, saying efforts by New Zealand's athletes gave "the silver fern on a black background a distinctive and uniquely New Zealand identity". But he said he was open to all ideas and that retaining the current flag was "a very possible outcome of this process". A group of cross-party lawmakers would oversee the vote process and a steering group would seek public submissions for new flag designs, he said. Mr Key said there was no move to cut ties with the British monarchy. "We retain a strong and important constitutional link to the monarchy and I get no sense of any groundswell of support to let that go," he said. It is not clear to what extent there is support for changing the flag. One poll late last month showed only 28% of respondents wanted to change the flag, compared to 72% who were happy with the current version. Representatives of service personnel have argued that troops have fought and died under the existing flag. "The view of the RSA is there is no need to change the flag,'' Don McIver, national president of the Returned and Services Association (RSA), was quoted as saying by the Associated Press news agency. The opposition Labour party has said it supports the process. "We're not going to differ or divide from the government on this issue. It's a broad constitutional issue, if the country wants a debate about the flag so be it, but it's not the primary issue for this election," leader David Cunliffe said. The polls have been scheduled so that a new government will be in place by the G20 meeting due to take place in Australia in mid-November. Mr Key's National Party currently has a sizeable lead over the Labour opposition, polls show.